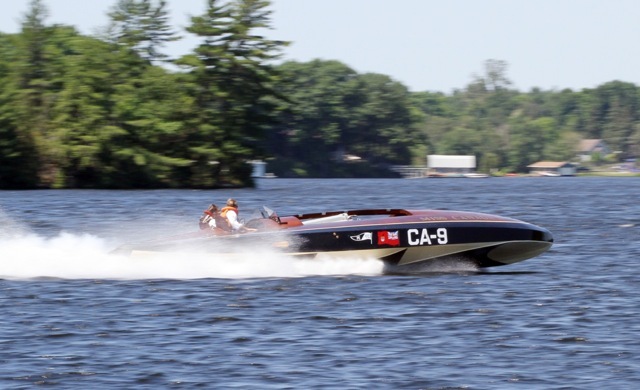 Bobby Genovese’s world famous Miss Canada IV will take center stage at Picton, Ontario’s Prince Edward Yacht Club on October 2 and 3, 2015 to commemorate the 65th anniversary of her historic 200 mph run at the World Water Speed record. Admission for the two-day event is $10. “Who would have ever thought that Miss Canada IV would return to the waters of Prince Edward County 65 years after Harold and Lorna Wilsons’ attempt at the World Water Speed Record,” said her owner, BG Capital Group Chairman Bobby Genovese, of this inaugural event hosted by Thunder Events of Picton (TEP). Genovese is a devoted collector of vintage Canadian race boats, including Miss Canada III, and Canadiana Grand Prix. He also owns Rambler, a restored 70ft 1903 Polson Iron Works Yacht, Miss Miami V, and Pistoff, a 1960, 970-horsepower twin engine Vic Carpenter custom runabout. “This gathering will be a great opportunity for visitors to see many of the race boat legends that competed in Picton,” said BG Vintage Racing Team Manager Jamie Smith, who heads Genovese’s BG Vintage Race Boat and Antique Boat Museum, which is expected to be completed next year. The anniversary festivities will feature a static display of vintage hydroplanes and race boats including Miss Canada IV and give attendees the opportunity to meet the drivers and crews along with notable celebrities of current and past hydroplane racing fame. TEP was established to promote boat racing, both vintage and professional, in Prince Edward County. Thunder on the Bay is made possible thanks to financial support from local businesses and individuals with the desire to bring race boat fans back to Prince Edward County. Net proceeds of this event will support local charities, the PEC Heritage Fund, and future events. Thunder Events is owned and operated by Larry Ritchie, Board Director of the Prince Edward County Chamber of Tourism and Commerce and owner of Picton Harbour Pontoon Tours.